DayWeather Radio Network, founded in Cheyenne, Wyoming in 1992, has grown from a handful of affiliates to a Regional Network delivering local weather forecasts to 78 affiliates in 39 markets and 4 states in the Rocky Mountain High Plains Region. DayWeather delivers each forecast separately several times per day. Forecasts are tailored to the local weather conditions for each location, based upon our meteorologists' ability to combine their analysis of multiple computer models with experience and knowledge of the region's volatile weather patterns. Over the years DayWeather earned a very large dedicated audience by consistently providing accurate and dependable local weather forecasts. Spanning all demographics we provide these services to personal and business interests. 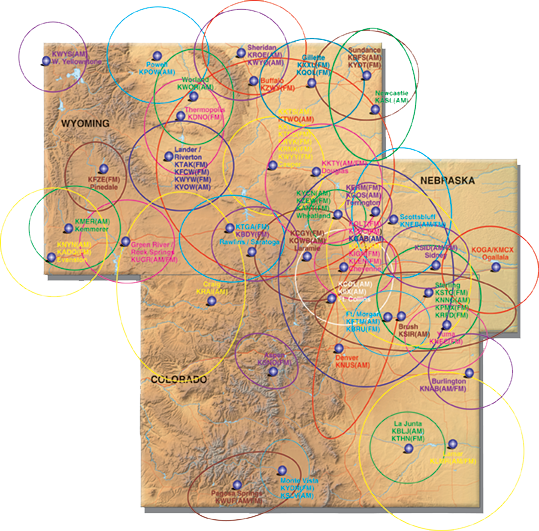 Use the DayWeather Radio Network to reach your customers in Wyoming, Colorado and Western Nebraska. DayWeather is the number one rated regional network in Wyoming, Colorado and Western Nebraska and has been since 1995, according to the latest (2013) AMR biennial survey. This ranking reflects the high value placed on the accuracy and dependability of these local Ag information oriented weather programs by regional Ag Producers. The 2013 AMR Survey shows that: DayWeather Network is number one with all producer groups, regardless of time period or rating category in its primary market area! This wide margin of producer preference over our nearest competition is also evident in "Subsets" of the primary market area. Your client can select only those markets required. For example, the 2013 AMR confirms DayWeather Network is number one in Eastern Colorado and Western Nebraska for corn producers, as well as Wyoming, Colorado and Western Nebraska for cattle producers. The ability to "Cherry Pick" locations is a DayWeather exclusive; no other regional radio network offers this option! Configure your choice(s) of locations, depending upon your demographic requirements; "Cherry Picking" is encouraged and recommended, to help you buy the smartest, most effective marketing program. 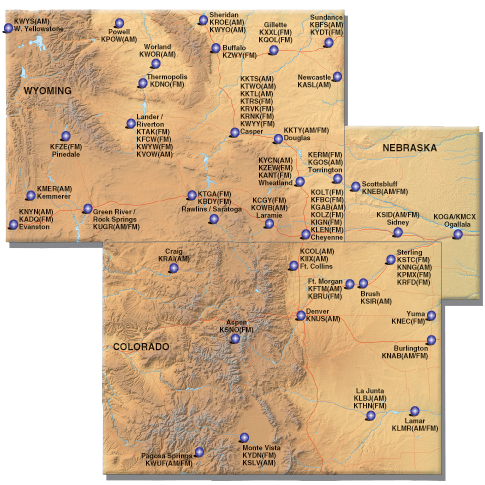 Select by market (minimum of 2), or state(s) of Colorado, Wyoming and Western Nebraska. Every location you choose receives a locally specific weather forecast program 2 to 3 times daily, allowing you to tailor your message to the specific market you are trying to reach.